For the #3 ingredient Dish of the Blogging Marathon this month that I am participating. Frankly it’s just to prod myself that I took up the theme. So when I looked up #3 ingredient dishes I was surprised at the number of choices we have. So of them so unbelievably easy and yet tasty. 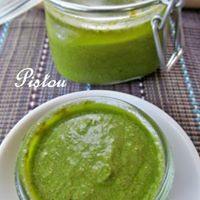 Like this ” pistou” it’s nothing but pesto that is adapted in the French Provence! In case you are interested in the making and history of Pesto then read on else you can skip on to the recipe itself. The name pesto comes from the Genoese verb pestâ (Italian: pestare), which means to pound, to crush, the way pesto was originally prepared , the ingredients were “crushed” or ground in a marble mortar through a circular motion of a wooden pestle. Since you can crush just about anything pesto is a generic term for anything that is made by pounding a combination of flavourful leaves, oily nuts, hard cheese, olive oil, garlic, salt and lemon juice; any ingredients meeting this description can produce a pesto-like condiment. This explains your different pesto. Pesto’s predecessors date back to Roman times when it was called “moretum” and was made by crushing garlic, salt, cheese, herbs, olive oil and vinegar together. During the Middle Ages, a popular sauce in the Genoan cuisine was “agliata”, which was basically a mash of garlic and walnuts, as garlic was actually a staple in the nutrition of Ligurians, especially for the seafarers. The belief is that basil was introduced more recently. The basil may have been introduced in cooking may have originated from India. But once introduced it took the firmest root in the regions of Liguria, Italy, and Provence, France. Basil is used a lot in Genovese cuisine, though only when in the season, the other substitutes are marjoram and parsley. This recipe for pesto Alla Genovese was often revised in the following years and it shortly became a staple in the Ligurian culinary tradition, with each family often featuring its own pesto recipe with slight differences to the traditional ingredients.So now you know why there are so many different kinds of pesto. In French Provence, the dish evolved into the modern pistou. What can you eat Pesto with? Pesto is commonly used on pasta, traditionally with mandilli de sæa (“silk handkerchiefs” in the Genoese dialect), trofie or trenette. Potatoes and string beans are also traditionally added to the dish, boiled in the same pot in which the pasta has been cooked. It is sometimes used in minestrone. Pesto is sometimes served with sliced beef tomatoes and sliced boiled potatoes. Pesto alla Genovese: the quintessential pesto recipe, is made with Genovese basil, coarse salt, garlic, Ligurian extra virgin olive oil (Taggiasco), European pine nuts (sometimes toasted) and a grated cheese like Parmigiano Reggiano or Grana Padano and pecorino sardo or pecorino romano. Sometimes almonds are used instead of pine nuts, and sometimes mint leaves are mixed in with the basil leaves. As I said earlier a combination of flavourful leaves, oily nuts, hard cheese, olive oil, garlic, salt and lemon juice; any ingredients meeting this description can produce a pesto-like condiment. We also have Pesto alla siciliana, sometimes called pesto rosso (red pesto) is a sauce from Sicily similar to pesto alla genovese but with the addition of tomato, almonds instead of pine nuts, and much less basil. check the recipe here. Pesto Alla calabrese is a sauce from Calabria consisting of (grilled) bell peppers, black pepper. The Pistou as made in the Provence and the recipe of which follows. Pistou is used in the typical soupe au pistou, a hearty vegetable soup with pistou flavour. Okay now let’s move on to the Pistou recipe adapted from here. Just #3 ingredients make this delicious Pistou that is different from Pesto as there is no addition of nuts and cheese. It’s delicious and a must try. Put basil and garlic in the mixer. Blend until creamy and well blended. Store under extra virgin olive oil. I needed 1/2 cup of Olive oil for covering the Pistou and storing it in the fridge. That’s a lovely dip..and I remember reading about this when I made Pesto..
That is a nice info on pesto sauce. Looks very vibrant.. I am imagining how flavorful it would be.Lovely. Wow! That is a very flavorful pesto there. Lovely post Archana. Pistou looks very vibrant and delicious.